Composed by Paul SanGregory. 21st Century. Score. 20 pages. Published by Distant Engraver Music (S0.365373). 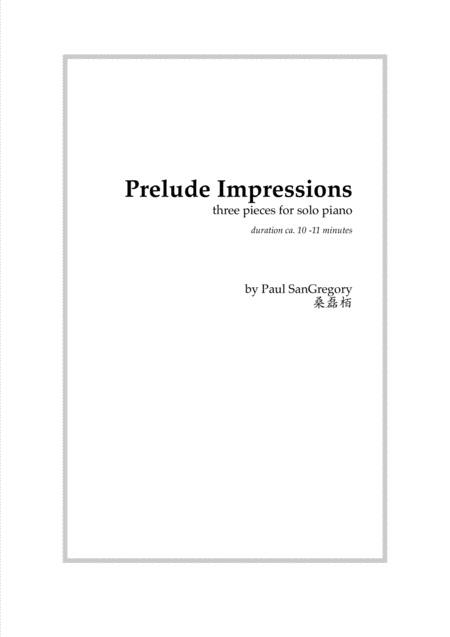 This set of three pieces is well-suited for advanced students or professional performers who enjoy creating and shaping mood, atmosphere and color on the piano. They were composed to commemorate the 150th anniversary of Claude Debussy’s birth. For that reason, they are based on various composing techniques and aesthetic ideas that he developed. Even so, there was no attempt to make them actually sound like Debussy’s music. In fact, while composing them I often felt like I was looking at Debussy’s techniques through the distorting lenses of music that came after him, but that he had influenced. One sort of change in this piece comes from the interaction of two repeated rhythmic patterns of different lengths. Episodes of contrasting character then drift in and out of the piece creating more changes. The effect is as if one is floating quietly through empty space, but occasionally drifting past various objects or situations. To me, the opening of this movement sounds like an idea from Debussy’s “Nuages” that has been turned inside out. Unlike Debussy’s more delicate clouds, however, the clouds of this piece grow turbulent and dramatic. For this movement, I imagine walking through an open untamed field on a dark moonless night and not being sure what I might be passing by. In terms of color and technique, this piece shows a more obvious relationship to Debussy’s music that the first two. It begins with a simple melody similar to that of his “Bruyére”, after which a Debussy-inspired ostinato gently moves the music forward. Structurally, the whole piece is an inverted palindrome so that a melody from the beginning returns in retrograde-inversion at the end, becoming a brief quote of Debussy’s music. Performance duration ca. 11 minutes.